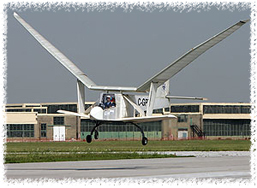 Read Ornithopter pilot Jack Sanderson's update on the July 8, 2006 Flight in the Pilot's Corner. Take a look at our video section for the videos of the sustained flight. Don't forget to check out our photos. As a follow-up to the July 8, 2006 Ornithopter Report, we've released our July 19, 2006 Ornithopter Update. Adobe Acrobat Reader is required to view the reports. noun An aircraft that derives all of its thrust and nearly all of its lift from flapping wings. In addition, an ornithopter retains 'bird like' characteristics such as its main wing in front and its stabilizing surfaces aft. The purpose of this project is to achieve humanity's oldest aeronautical dream: flight with mechanical flapping wings. Many early aircraft concepts assumed that such imitation of birds and bats was the proper design direction. However, the challenge of achieving both efficient lift and thrust with flapping wings was far greater than simply using the wings for lift and providing thrust with a separate propulsor. This notion, first articulated by Sir George Cayley in 1799, provided the template for successful mechanical flight from the Wright Brothers to this day. The notion of ornithopter flight became marginalized, although it continued to fascinate inventors and researchers as described in the History section. One of the reasons for this is that successful full-scale piloted ornithopter flight is one of the last great aeronautical records. Despite all of the amazing aerospace achievements since the Wright Brothers, such as hypersonic flight, voyages to the moon, and travelling around the world without refueling, this ancient quest remains to be accomplished. This website will describe ornithopter research, design, and testing by a team based at the University of Toronto's Institute for Aerospace Studies. Included will be the project's history as well as current results.